When my wife and I decided to commit to running a 50K race this year, we choose Surf the Murph for a number of reasons. Many people suggested to us that it was a great race for a first time 50K, and since it was local, we decided to sign up. Both of us knew that completing this race would mean we had crossed over that dangerous line into being ‘ultramarathoners’. This race would be the longest distance that either of us had ever attempted, and that fact alone meant that we have better be ready for a long day in the woods. The day before the race was a rainy one, meaning that the course would probably have a good amount of mud that we would need to traverse. Thankfully, the rain stopped about 30-40 minutes before the race start, so at least we didn’t need to worry about running in the rain. The air temp was around 50 degrees, and it stayed at 50 for pretty much the entire day. We were running under overcast skies until after mid-day, but the wind kept the air temp somewhat cool even when the late afternoon sun tried to bake us. Throughout the day I wondered if I should have worn shorts, but since all I brought was tights, I’d need to make do. The 50K race starts an hour after the 50 milers launch, so at 7am we headed out from the start line. Because it was still pre-dawn we all had to wear headlamps until the first aid station. This also meant that the initial portions of the course would look new and fresh to us when we came around for our second loop. Surf the Murph is a looped course with three race options: 25K with one loop, 50K with two loops, and 50 miles with three loops. Because the 50 mile distance meant that things didn’t divide evenly, this was actually a long 50K course, coming in around 33-34 miles. If we were going to earn our ultra badge, we were really going to earn it. By the time I reached North Aid Station (AS1) it was light enough for me to put my headlamp away. I was also warmed up enough that I was able to stow my gloves and buff in my pack. The entire northern section of the loop is a relentless series of short sharp hills. None of the hills are terribly tall, but when you keep facing them one after the other, for 4-5 miles, it starts to wear on the body quickly. Within a couple miles of AS1 the hills gave way to much gentler terrain and before I knew it I was already at Horse Camp 1 (AS2). When I got to AS2 I was feeling pretty good and was moving well. The ability to get in some solid running miles after the hills on the northside felt great, and my body liked being able to open up a bit and burn off some of the nervous energy of the morning. The next 3-4 miles to the next aid station were some of my fastest miles, and I was really enjoying a wonderful day for running. The flat ground did eventually give way to more terrain, and I soon approached a beautiful hill overlooking the prairie. I fell back into my hiking routine before blasting down a fun side trail that was opened up for the racers. It was on this portion that I also encountered my first ‘almost fall’ as I did a spectacular flail as I slid down a muddy hill. A woman running behind me yelled ahead that she thought for certain I was going down. I managed to stay upright, but I got my first lesson in respecting the muddy downhills. I made it to Natchez Aid Station (AS3) feeling good. I decided that in this race I would start adding some caffeine into my nutrition to stave off the sleepy feeling I got during Superior. I had some caffeinated shot blocks with me, but I didn’t want to rely solely on those, so starting at AS3 I started grabbing some Coke as well as some simple snacks. I’m happy to report that the caffeine strategy seems to have worked really well, and I didn’t have any adverse reaction to it! After AS3 there is a mile long section of road to get to the next trailhead. I’ve been told that this route was new this year, because of other changes that need to happen along the course. After the section of road, I ducked back into the woods and proceeded to knock off miles as best I could. It was around mile 11 that I got my second encounter with mud. As I tried to skirt around a large patch of squishy sticky mud, I planted my foot wrong and my shoe came clean off. I’ve always been rather good a leading with my toe in muddy areas, so as to avoid this situation, but this time I didn’t. I made it 2-3 steps before I was able to regain my balance and go back for my shoe. I wasted a couple minutes getting it put back on over my now completely muddy sock and started back down the trail feeling somewhat peeved. It was shortly after mile 11 when we emptied out onto another prairie section. Another woman caught up to me and we chatted idly for a while before noticing a problem. We were getting to the end of the prairie section and we saw another path merging with ours on the left. That path had marking flags and there were a couple of running coming down it. Apparently, we had missed a turn-off and ended up cutting almost a full mile off of the loop. Needless to say I was frustrated by this. I knew that I’d be fine for total mileage since this was such a long 50K course, but now I was feeling like I needed to put an asterisk next to my ‘race time’. My only consolation at this point was that we had seen many other runners making the same mistake, so maybe it wasn’t too bad. I arrived at Horse Camp 2 (AS4) in a slightly sour mood. I grabbed some coke, a bit of food and headed back down the trail. I knew that the next stop would be the Start/Finish area and I could at least put on a fresh pair of socks and empty out my shoes from the mud encounter. This final section is a slight return to the hilly rollers of the northern section, although not quite as severe. It’s a rough section to have to navigate as you’re heading back to Start/Finish knowing that you have to head back out there again for another loop. Because Surf the Murph is a looped course, they allow people to drop down a race level if they want to stop after each loop. So if I had been feeling absolutely horrible I could have stopped and taken a 25K finish time. I wasn’t feeling horrible though, just cranky, and so I meandered over to the Start area to change my socks and head out for another loop. The sock change took me a good 5 minutes of wrestling, but eventually I managed to get everything back in order and get back on the course. The section from Start/Finish to AS1 on the second loop was my lowest time emotionally. I was pissed at missing the turn off, I was pissed at the relentless hills, and I was pissed that I hadn’t been able to get the first loop done closer to 3:15. Needless to say, none of this surprised me, and I’ve read enough race reports to know that sometimes you just get to a low point and it becomes about putting one foot in front of the other until it passes. For me, my mood brightened immensely when I got to AS1 and found my co-worker Jason there volunteering. Jason and the rest of the AS1 crew were in high spirits and they joked around and handed out tons of encouragement. I managed to start smiling and before I left I grabbed a square of a PB&J sandwich, that somehow tasted like the best damn PB&J sandwich I have ever had in my life. I’m sure it was just an ordinary sandwich, but at that moment it was ‘happy food’ and I enjoyed every bite. I even contemplated turning around to grab another square, but I knew better than to do that. Even though I still had a couple miles of hills in front of me I walked with a new spring in my step. I managed some running before AS2 and arrived feeling like my second wind could hit soon. While at AS2 I ran into my friend Janet, who I ran the first half of Superior Moose Mountain Marathon with! She was leaving the aid station at the same time as me and so her, another Janet from UMTR, and I hit the trail together. Janet was attempting her first 50 mile race, and so she was also on her second loop. She was struggling and so the other Janet and I tried to keep her going as best as we could so that she could make it to the Start/Finish before the third loop cutoff. As we rounded the small lake on the southern end I felt my second wind kick in, and despite wanting to keep sticking with Janet to keep her moving I knew I couldn’t squander my energy. I bid the two Janets farewell and hit the trail with a decent amount of running considering I was approaching 24 miles and soon would be setting a new distance record with every step. I rolled into AS3 and got to see Wendi and ran into another Adam that I knew, which again lifted my spirits a ton. I even started to get a bit giddy as I hit the road section again. As I was walking a bit to digest the food and pop I just ate, I erupted in some rather loud belches, and I’m sure I startled the woman running ahead of me. I apologized but really I was giggling a bit inside at this runner with a beer gut out in the woods letting rip huge burps. 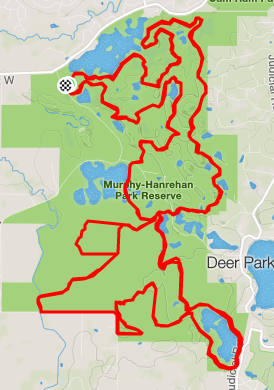 I finished the road section and carefully avoided the mud trap that had stolen my shoe on the first loop. I then decided that I had better keep a sharp eye out for this turn-off that I missed the first time. In a funny coincidence the same woman that I was running with the first loop was arriving at the turn at the same time and we both looked at each other and said, “How the heck did we miss this before! ?” There were clearly flag markings directing us down this side path, and we both continued on our way slightly confused. It was on this side loop that I finally ditched my compression shirt, giving in to the sun that was in full bloom now. I managed to make my way into AS4 wishing my third wind would kick in, as I was starting to drag a bit. I downed some pop, but at this point food was no longer appealing to me. I hit the trail again knowing that the next time I stopped it would be at the finish. I was also well into unexplored territory for me in regards to distance. I had never run over 26.2 miles before, and I left AS4 about to click off mile 29. The hills returned again one more time, but thankfully my third wind kicked in and I actually managed to run about half of the distance back to the finish. Along the way I bumped into the amazing Julio who was on his way to find Janet and pace her for her final lap. I told him she was back there a bit, and he better hurry because she only had 30 minutes to beat cutoff. He sprinted off, ready to be the amazing pacer that he is, and I continued to make progress to the end. I knew that the finish line was up a small hill, but it seemed like every hill I came to wasn’t the right one. Eventually I heard the cheering and clapping and I knew it was just around the corner. I managed the best 10 minute/mile that I could as I sprinted up the hill to the finish and across the timing pad at 7 hours and 40 minutes. I had finished. I stopped to take stock of my body and realized that overall, I was in pretty good shape. Nothing was damaged, my stomach had behaved, and I could still move under my own power. I walked over to the fire pit to get my award piece-of-wood and then get it stamped with the 50K text. Another guy I’ve gotten to know, Rob, was working the finish and gave me tons of congratulations as I started to move over to my drop bag to get cleaned up. Along the way I ran into Tim and I regaled him and Rob with my tale of missing the turn-off on my first loop. At that point Tim put my mind at ease by telling me that apparently dozens and dozens of people had missed the turn, including himself. When he got to AS4 on his loop he corralled a volunteer and told them they needed to get out there and get better markings on the corner. That’s the reason why it was so obvious the second time around, the problem had been mitigated. Hearing all this made me feel a lot better about not worrying about the missed mile. My wife told me that she even missed it the first loop as well. After my spirits being lifted, I headed over to my drop bag to settle in. After getting cleaned up a bit I gathered some more food and started to look at who else was finishing. It was right around the cutoff time and so I went to look if Janet had made it and sure enough she was taking a quick sit down in the Start area with Julio getting ready to take her out for her third loop. Robyn even volunteered to go along for part of it to help, and with all of us cheering and encouraging her she headed out for her third (and successful!) final lap to get her first 50 mile. By this point I had a nice sandwich in my stomach and was feeling pretty comfortable so I headed back to the finish corral to take a seat and wait for my wife (she finished strong as well!). Rob came over and sat with me to keep me company as we watched tons of runners coming up the hill to the end. It was an awesome and relaxing way to end the afternoon. As I chatted with Rob I commented that I was feeling pretty good, much like I did after Moose Mountain Marathon. After Moose I felt like I could take on the next level of challenge, and after Surf I once again felt like that next level was probably within my reach. I even commented that I probably could have even gone out for a third loop that day. It would have been a ‘death march’ loop, but I probably could have done it. This is the way I want to finish races and new challenges. Looking back at the day without any regrets, not overly concerned with my time and pace, not concerned if I DNF, and feeling like I’m ready for the next thing. Surf the Murph was an excellent course to do my first 50K on, and I would highly recommend it to other runners contemplating longer trail races. It’s a popular course for first time ultramarathoners and I was happy to be one of them. It was a great day to be in the woods surrounded by great runners and volunteers, making amazing memories and achieving more than I ever thought I could achieve when I started this crazy running journey in 2010.